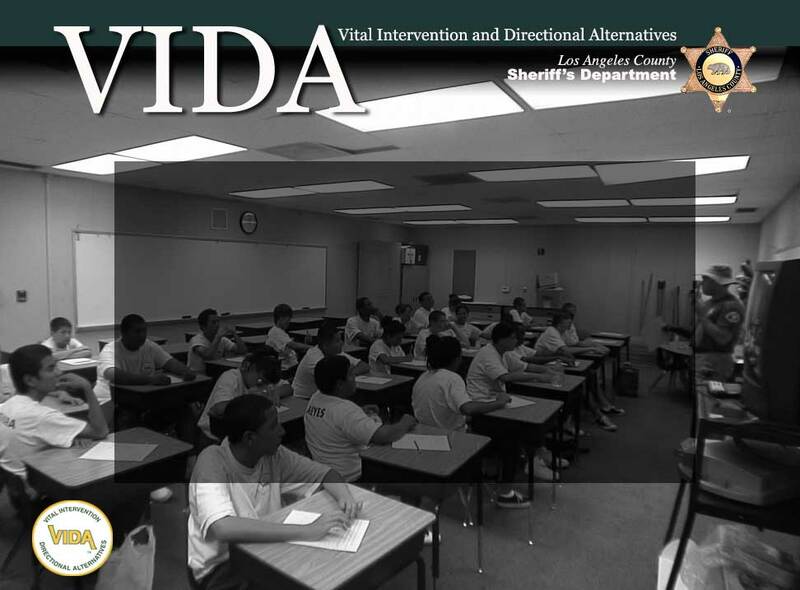 Thank you for visiting the Los Angeles County Sheriff’s Department’s, Vital Intervention and Directional Alternatives (VIDA) Website (LASD Website). The purpose of this website is to communicate general information about or relating to the Department’s youth intervention program, VIDA. Your use of this website constitutes your agreement to abide by these terms and conditions. If you do not accept any of the terms below do not use this Website. 1. ACCEPTABLE USE: This website may be used only for lawful and authorized purposes. 2. PROHIBITED USE: All uses of this website which are in violation of any federal, state or local law, County of Los Angeles Code, LASD’s policy, or these terms and conditions is strictly prohibited. You shall not restrict or inhibit any other user from using and enjoying any service conducted on this Website, nor shall you upload, transmit, distribute or otherwise publish on this Website (i) any unlawful, threatening, abusive, discriminatory, defamatory, obscene, vulgar, pornographic, profane or indecent materials; (ii) any materials which infringe any intellectual property right of any third party or advertise or otherwise solicit funds or is a solicitation for goods and services; or (iii) any materials containing a virus or other harmful component. While the LASD has no obligation to monitor the Website and is not responsible for the content of any messages, information or files transmitted on the Website, the LASD reserves the right to delete, move, edit, refuse to post or take other appropriate action with respect to such messages, information or files which the LASD, in its sole discretion, deems objectionable or otherwise in violation of these terms. Unauthorized modification of any information stored on this system may result in criminal prosecution under Federal, State, and local law. 4. COMMUNICATIONS: The LASD does not guarantee the accuracy, reliability, or confidentiality of any communication/information contained in this Website. This Website should not be used to transmit any sensitive or confidential information to the LASD since such information may be easily intercepted. Given the unreliable nature of Internet communications, information transmitted to the LASD via electronic means may not be received at all, nor received or reviewed in a timely manner. 5. PROHIBITED USE OF STAR/LOGO: The use or copying of the SERVICE MARK, SEAL, STAR, MARK, LOGO OR BADGE of the LASD is restricted by law and may be used only with written permission of the LASD. You may NOT download, use, disseminate, publish or copy the seal, star, mark, logo or badge, displayed on this Website without written permission from the LASD; they are registered service marks owned by the LASD. You may not remove or obscure the trademark/copyright notice(s) contained in the materials in this Website. Copyright and trademark infringement are violations of federal law and subject to criminal and civil penalties. 6. TRADEMARK AND COPYRIGHT: (a) ALL RIGHTS RESERVED. Other materials other than those listed above, published on the website may also be protected by trademark/copyright, and owned or controlled by the LASD, or the party listed as the provider of the content, software or other materials. Commercial use of the materials is prohibited without the written permission of the LASD or its owner. (b) UNAUTHORIZED COPYING, REPRODUCTION, REPUBLISHING, UPLOADING, DOWNLOADING, POSTING, TRANSMITTING OR DUPLICATING ANY OF THE MATERIAL IS PROHIBITED. You may download or copy any downloadable materials, except the seal, star, mark, logo or badge, displayed on the Website for home, noncommercial and personal use only, provided that you maintain all copyright, trademark and other notices contained in such material and you agree to abide by all additional copyright notices, information or restrictions contained in any material accessed through the Website. 7. MODIFICATION OF TERMS: The LASD reserves the right to modify, change, update or alter these terms at any time without notice. Your continued use of this Website constitutes your agreement to comply with such modifications. 8. NOT LEGAL NOTICE: Communications made through this Website’s e-mail and messaging system shall in no way be deemed to constitute legal notice to the LASD or any of its officers, employees, agents, or representatives, with respect to any existing or potential claim or cause of action against the LASD or any of its officers, employees, agents, or representatives, where notice to the LASD is required by any federal, state or local laws, rules, or regulations. 9. CONSENT TO MONITORING: The LASD and its agents may monitor and audit the usage of this system, and all persons are hereby notified that use of this system constitutes consent to such monitoring and auditing. 10. LINKS: The information provided on this Website and links to other related Websites, are provided as a courtesy to Website visitors only, and are in no manner an endorsement, recommendation or approval of any person, any product or any service contained on any other Websites. Any link inconsistent with the County of Los Angeles’ policy on hotlinks is void and inappropriate. The LASD does not endorse or support any of the advertising that may be contained on any linked site. The links are allowed in compliance with the law and County of Los Angeles policy. 11. DISCLAIMER: The LASD is neither responsible nor liable for any viruses or other contamination of your system nor for any delays, inaccuracies, errors or omissions arising out of your use of the Website or with respect to the material contained on the Website, including without limitation, any material posted on the Website. The LASD attempts to maintain the highest accuracy of content on this Website. Any errors or omissions should be reported to the LASD. This Website AND ALL MATERIALS CONTAINED ON IT ARE DISTRIBUTED AND TRANSMITTED "AS IS" WITHOUT WARRANTIES OF ANY KIND, EITHER EXPRESS OR IMPLIED, INCLUDING WITHOUT LIMITATION, WARRANTIES OF TITLE OR IMPLIED WARRANTIES OF MERCHANTABILITY OR FITNESS FOR A PARTICULAR PURPOSE. THE LASD IS NOT RESPONSIBLE FOR ANY SPECIAL, INDIRECT, INCIDENTAL OR CONSEQUENTIAL DAMAGES THAT MAY ARISE FROM THE USE OF, OR THE INABILITY TO USE, THE WEBSITE AND/OR THE MATERIALS CONTAINED ON THE WEBSITE WHETHER THE MATERIAL IS PROVIDED BY THE LASD, OR A THIRD PARTY. 12. DISCLAIMER /CHANGES TO WEBSITE: The LASD may change the information contained in the Website at any time and without notice. The LASD assumes no liability of damages incurred directly or indirectly as a result of errors, omissions or discrepancies. DISCLAIMER/ENDORSEMENTS: Some of the material contained in this Website may be supplied by third parties and users. Any opinions, advice, statements, services, or other information supplied by third parties or users do not necessarily state or reflect those of the LASD. If any reference is made to any specific commercial entity, organization, company, product or service, it should not be construed as an endorsement, promotion, recommendation, favoring or advertisement by the LASD. 13. LOCATION OF WEBSITE: The LASD operates this Website through “911Media” and its offices in Los Angeles County and makes no representations that materials in this Website are appropriate or available for use in other locations. If you access this Website from other locations, you do so at your own risk and are solely responsible for compliance with any and all applicable laws, rules and regulations. 14. NOT 911 SERVICE: This Website should not be relied upon for emergency services and is in no way designed to serve as an alternative to the emergency services provided by 911 telephone service. If you have an emergency or important time-sensitive crime information, communicate this information with LASD by 911 emergency telephone service. 15. GOVERNING LAW: This Agreement shall be governed by, construed and enforced in accordance with the laws of the State of California as applied to agreements made and to be performed entirely therein. Any action brought to enforce the Agreement or in connection with this Website shall be brought in either the state or federal courts in Los Angeles County, California.